You might remember that I was looking for a way to add a side bound notepad to the inside front cover flap of my Filofax Finsbury a while back. I found a way to do that, thanks to a link my Filofax Friday partner Francine sent me, and last month I shared how you could create your own notepads using everyday white glue and copy paper, you can find the tutorial here. 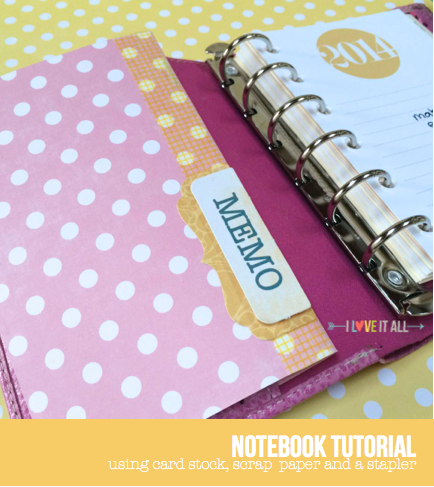 I thought I would go a step further and create another way to add notepaper to your planner. These measurements are sized for the pocket Finsbury, but play around a bit and I'm sure you'll be able to make something just like this for your favorite planner. Although this tutorial is sized for a pocket planner, you can easily modify the measurements to fit into into any pocket flap your planner may have. Because the notebook can easily be pulled out, without having to fiddle with the papers in the rings, my daughter that constantly wants to draw and doodle and write stories, can create to her hearts content. After trimming your desired papers, I used notebook, graph and copy paper, clip them to the card stock to hold in place and then flip over and staple from the front cover to inside cover. That ensures that the flat side of the staple is what shows on the spine and the folded part of the staple is inside the notebook. 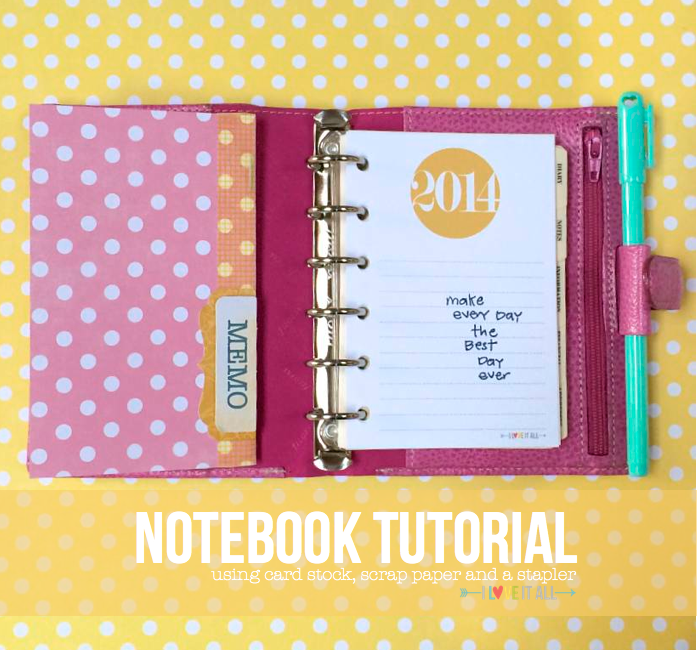 Insert your DIY notebook into your planner pocket and enjoy. When this one is filled up, I'm sure you'll want to make more! I embellished my notebook spine with washi tape and a layered sticker from My Mind's Eye. 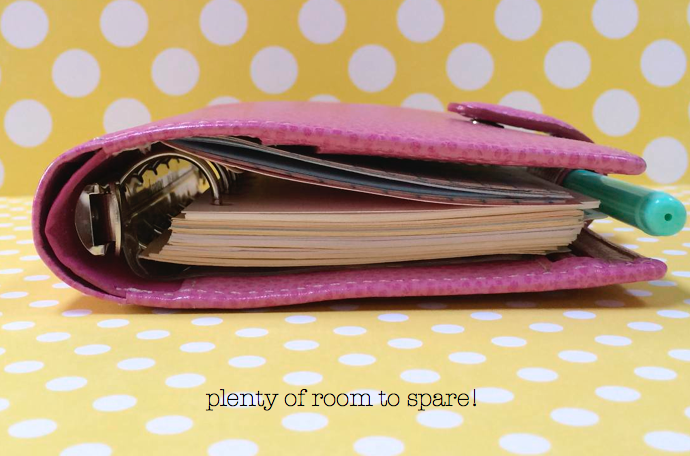 See, even closed, there's plenty of room to stuff your planner full, even with the DIY notebook included. If you'd like your own copy of the 2014 notepaper you see in this post, you can find it here, it's available in pocket size, personal size and A5. 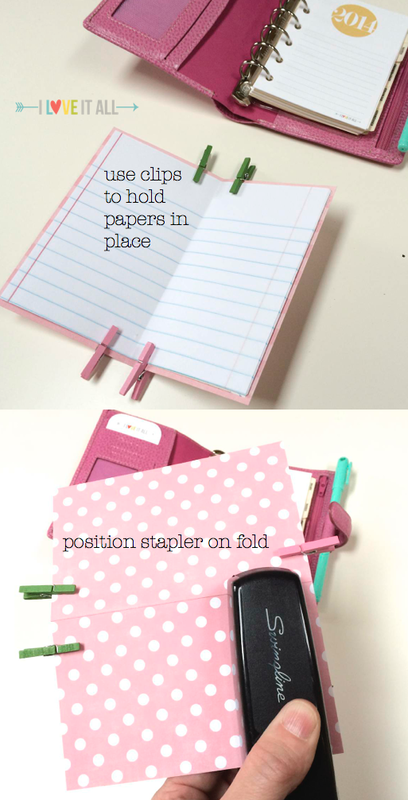 Find me on Pinterest where I have a board called to filofax where I pin fun planner goodies. Find more Filofax downloads here. Leave a comment telling me your favorite organizational tip and I'll choose a winner for a $20 gift certificate to I Love It All. Entries will close at 8pm EST on Friday, April 11, 2014. THE WINNER of the $20 gift certificate IS VICTORIA TUPPERGAL. 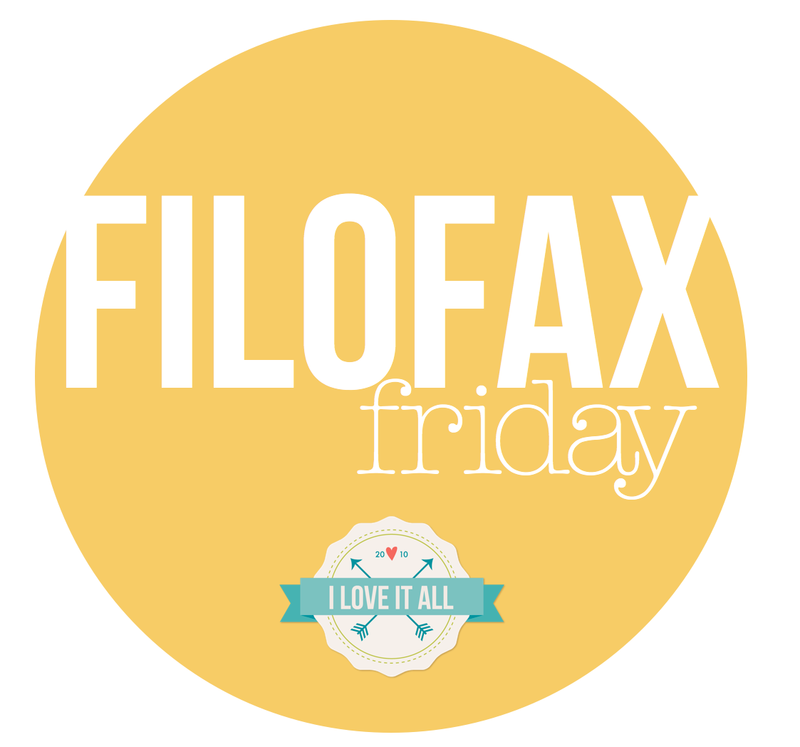 Now, let's go see what Francine has for this month's Filofax Friday! That is super cute! I love those colours together. Nice post Monika! My favorite tip is to organize my embellishments by color, makes things much easier! My favorite organizational tip is an oldie but a goodie - mason jars! I use them to hold fabric scraps separated out by color but you could use them for anything - buttons, scrapbook supplies, spools of thread. They look cute with a ribbon or twine tied around the top, too! I love this...much simpler than I thought:) One thing I have been doing lately to help with my organization of projects is to use a magnetic strip above my desk to post pictures I have printed of finished projects I am striving to finish. Each project then has it's own "pod" or container (from Ikea) below it. It helps me stay focused on what I want to accomplish and make it easier. My favorite tip is to use small post it notes for repeatable items, like water plants, take out trash and that sort of thing. Love this idea, it will make a great travel journal for my up coming trip. That's a great idea, I was toying with the idea of using my pocket chameleon as my purse again (or wallet as you're across the pond 😉) so I could add this easily! I will tag you on Instagram when I've done it. My favourite tip is to set my goals, break them down into small steps, write them down and then check them off as you complete each one. Being able to see my progress really keeps me on track and the small steps stop me from throwing me hands up in the air in despair and giving up. May I ask where you got that super cute pen from? It's my favorite color and I love the little heart in the cap, too cute! The pen was one of a pack of 4 from the Target Dollar Spot back in the Spring. Wish I could be more help for you, but they may have something similar in their Fall goodies if you check. Thanks for dropping by, I hope to have you back for another visit soon! Thank you! I'll have to keep an eye out there in the future. I've actually already gotten lucky there recently. Cute note pads that I was able to punch and add to my binder, they're the perfect size!